Ubisoft Montreal might have spoken just a little too soon about whether or not 2011 will see a new Assassin's Creed game. 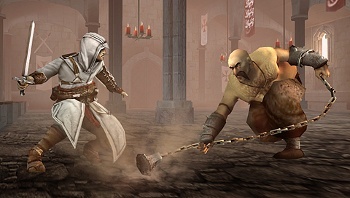 Remember how, last week, Ubisoft Montreal's Jean-Francois Boivin talked about how Ubisoft needed to give the Assassin's Creed series a break to ensure it retained its high level of quality? It turns out that Bolvin, who serves as the associate producer for the franchise, may have spoken out of turn. During a conference call yesterday with CEO Yves Guillemot, the subject of a "breather" year for the series was broached during the Q&A session. Guillemot made a point of mentioning that the initial comments came from the production team (implying that it wasn't a decision from Ubisoft's management). After that, he continued to say, "the decision is not theirs." When asked for further information, Guillemot refused to say anything else. "It would not be right to comment right now," he said. Why Guillemot is playing things close to the vest remains to be seen, but it sounds like Ubisoft isn't entirely certain about when it's going to release the next big Assassin's Creed title after Brotherhood hits stores in November. I guess we'll just have to wait to find out if 2011 is going to see a new Assassin's Creed game.